So, the Hampton Roads area is once again getting hammered with winter weather that this place is just not accustomed to. It got so bad, they even shut the bases down early! As a result, I found myself with a little extra time on my hands. What else to do but update my website? 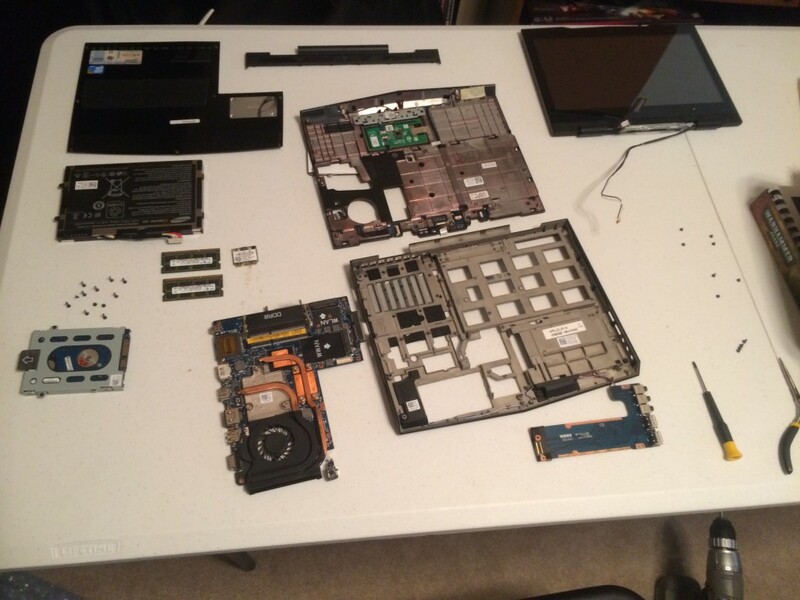 Lappy MKII is in pieces! Once I got to this stage, making the fan swap was fairly straight forward, as was the re-assembly. After plugging the battery in, I crossed my fingers, held by breath, and pressed the power button. I was greeted with….nothing. No lights, no beeps, nothing. Lappy MkII was dead as a doornail! Fighting down my sudden panic, I rushed to my office to scour the interwebs using my desktop, trying to figure out what on earth I could have possibly done wrong. After finding a few terrifying forum posts about fried motherboards, I finally stumbled upon a post that suggested someone with a similar problem check to make sure that the cable connecting the circuit board containing the power button to the mother board was seated properly. With that glimmer of hope, I once more tore my hapless laptop apart to get at the offending connection. To my relief, I found that the plug connecting the two boards was, in fact, loose. Fully seating it, I reassembled the computer a second time (I was starting to get pretty good at it by this point!). Now came the moment of truth. Holding my breath, I once more hit the power button. This time, Lappy MkII fired right up, and all was right again. Overall, I’m glad I undertook the repair. My Alienware is now running as quietly as the day I got it, and I only spent $30 and an hour and a half on the fan swap. Now, my little computer friend is ready for another couple of years of service. This entry was posted in Gaming, Status Update, Video Games and tagged Alienware, Lappy MkII, Video Games. Bookmark the permalink.